The second half of the 19th century was an incredibly exciting and contentious time for exploring the origins of human kind. Darwin’s theory, ‘On the Origin of Species by Means of Natural Selection’ had been published in 1869 and caused an uproar of controversy. It seemed at odds with the Christian account and debate of new ideas coming from the scientific community now reached fever pitch. Could this radical new challenge to the religious creationist line possibly be right? Having a theory was one thing, but it was up to the scientists to offer (as was their method) conclusive proof. Physical evidence would be needed to fill in the gaps. Darwin had come up with quite a piece sparked by his observations of finches in The Galapagos Islands. Did it add up? One of the first new pieces of evidence which seemed to lend more weight to the theory came in the shape of Java Man. Java Man is the name given to a set of fossils belonging to an extinct hominin that were discovered on the Indonesian island of Java. The fossils were found towards the end of the 19 th century and were the first known fossils of a species of archaic humans known as Homo erectus. The discovery of Java Man caused much controversy, and for some time, was even thought to have been a hoax. Although the discovery was not taken seriously at that time, Java Man was eventually classified as a Homo erectus , and earned its place in the history of human evolution. The story of Java Man begins in the 1880s, when a Dutch anatomist and geologist by the name of Eugène Dubois traveled to Southeast Asia. A student of Ernst Haeckel, who in turn was a proponent of Darwin’s evolutionary theory, Dubois’ was on a mission to find the ‘missing link’ between humans and apes. He started his work on Sumatra, another Indonesian island. When Dubois heard about the discovery of ancient human bones near Wajak, a Javanese village not far from Tulung Agung, in eastern Java, he moved to that island. Incidentally, the discovered human bones were later identified as belonging to a modern human, as opposed to an ancient one, as previously thought. In any case, Dubois arrived on Java in 1890, and began his work in August 1891 along the Solo River at Trinil. His ‘team’ consisted of two army sergeants and 50 East Indian convict laborers. In October of that year, a skullcap was discovered, and not long after, a femur, as well as a tooth, was found in the same pit. Using mustard seeds, Dubois measured the cranial capacity of the skull, and concluded that the owner of the skullcap had a small brain. As for the femur, Dubois noticed that it was modern looking, and regarded it as evidence that its owner had an upright posture. Initially, Dubois named his discovery Anthropithecus erectus (meaning ‘erect man-ape’), though later changing it to Pithecanthropus erectus (which translates as ‘erect ape-man’). Dubois published his find in 1894, which caused a storm of controversy at that time. His claim that he had discovered the elusive ‘missing link’ met with resistance from both the scientific community and the general public. This experience embittered Dubois, who decided to lock up the fossils in a trunk for the next three decades. This secretive behavior led to some speculation that the Java Man was a hoax. Dubois died a bitter man in 1940, as his discovery had not been taken as seriously as he had desired. Four years later, the remains were examined by Ernst Mayr, an American biologist, and Java Man was re-classified as a homo erectus . Subsequently, more fossils of homo erectus were found in Java, specifically at Sangiran and Modjokerto, thus providing a better view of this extinct hominin species. According to the entry for Java Man in the Encyclopaedia Britannica , Java Man had an average cranial capacity of 900 cubic cm, and its skull is described as “flat in profile with little forehead”. On the top of the head is a crest, which was attached to powerful jaw muscles. Moreover, Java Man had “very thick skull bones, heavy brow-ridges, and a massive jaw with no chin.” Whilst Java Man’s teeth were similar to those of modern humans, they also had some ape-like features, such as “partly overlapping canines”. Lastly, the femurs showed that Java Man walked upright, and it has been estimated that this species could grow to a height of 170 cm (5 feet 8 inches). Finally, it may be said that specimens of homo erectus were also discovered in China during the 1920s and 30s. 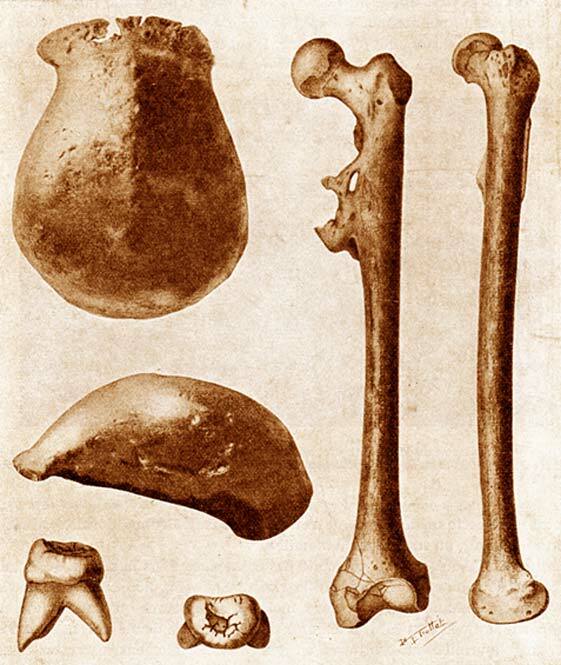 Although this confirmed Dubois’ theory that Java Man was a species of early human, the Dutchman himself refused to accept it, as he considered the Chinese fossils to be “degenerate Neanderthals”. 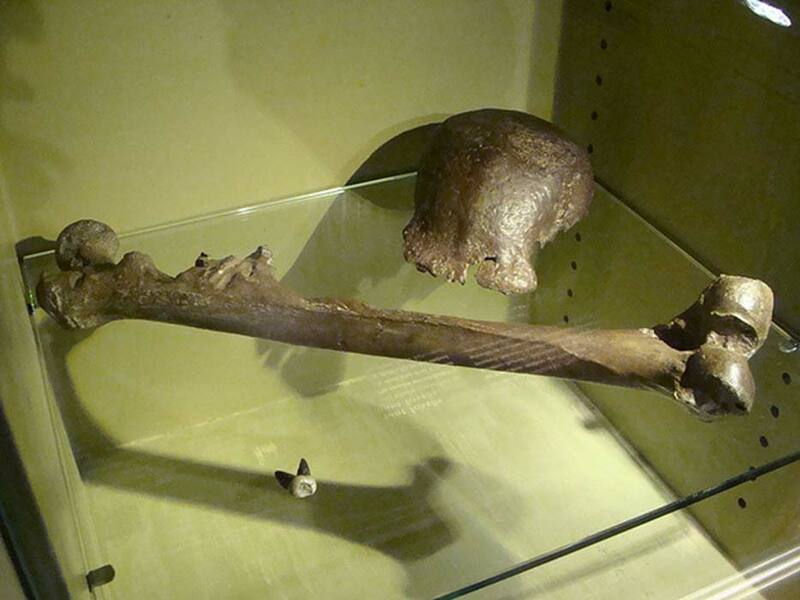 Top image: The original fossils of Java Man, National Museum of Natural History, Leiden, the Netherlands. Photo source: Wikimedia.